High-quality asparagus in only available for a few months, but it enjoys immense popularity during the short season—we could eat it all day long from April till the end of June. Beyond the classic dish for asparagus with Hollandaise sauce, the options are infinite for eating white and green asparagus. And if you have to wait every year for the season to come at last, you should enjoy it appropriately—with the best wine pairings! So let's answer some questions: Is red wine really a no-go? And which wine pairs the best with which asparagus dish? Together with our partner Wine in Black, we're presenting 3 delicious asparagus recipes and telling you which wine to pair them with. Furthermore, let's start with some basic tips on which wine you, your guests, and your asparagus recipe will enjoy! White vs. green asparagus: In general, you should serve subtle wines with white asparagus, since they leave enough room for all flavors to develop. With green asparagus, you can pair a stronger wine, like Sauvignon Blanc or Riesling. Make sure that whatever wine you chose, it isn't too acidic. Choose a wine according to side dishes: If you're serving asparagus with meat, choose a strong, expressive wine, like pinot blanc or pinot gris. The spicier the sauce, the stronger the wine. 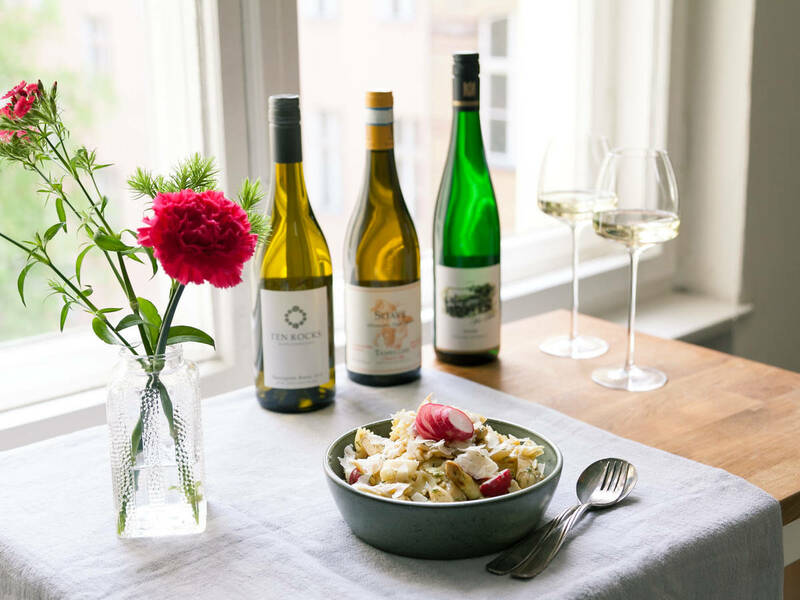 You'll never go wrong with a Pinot Blanc or Riesling in this case. The red wine issue: There are some people who would never ever pair a red wine with asparagus, but does that make sense? In fact, you should always avoid heavy, robust wines that will overwhelm the delicate flavors of asparagus. But if you serve it as a side dish with steak, pork chops, or entrecôte, feel free to serve a light red wine; the same goes for Mediterranean dishes, or if you grill green asparagus. With fine flavors, like in this green asparagus soup, make sure to pair light wines that are not too rich in alcohol. These wines are low-key in terms of flavor, which gives the soup more room to develop its taste. The wonderful fruit concentration and the creamy mouthfeel make this wine an ideal companion for this soup. For spicy and flavorful dishes, fruity wines work best! White asparagus goes hand-in-hand with Sauvignon Blanc. Its playful acidity harmonizes the citrus fruit flavors. Semi-sweet wines work very well as an antipole to acidid flavors, just like this Hollandaise sauce. Their delicate, fruity body is balanced by an acidic aroma that fits perfectly to the flavors of this dish. Cheers, to a delicious asparagus season!